There is nothing like sensationalized news to have people pay attention. Scandalous gossip creates groups, but so will adversity. The CadeFlaw Initiative is in its 3rd year. It has been over a year since it was announced the formal law was drafted by the California Judicial Counsel. It has been over a year since it was announced the drafted law was ready for submission and that all was needed was to promote signing the Initiative petition with the people of the world, particularly in California or find a California Legislator who would adopt it. Life goes on as it should, but when we forget promises made or fail to do what is important we are sure to turn a corner only to find the unexpected or the unspeakable waiting for us. Last week an unexpected unspeakable act of defamation and personal betrayal occurred. Michael is accused of molesting a former friend, one who claims to have recently become aware of this through regression therapy. Michael Jackson’s legacy is once again thrown into an arena which is ruled by public opinion and misinformation. It is unknown whether Michael’s heirs, his mother Mrs. Katherine Jackson, or his children, Prince, Paris and Blanket Jackson would have sought the civil action over this allegation. We cannot be sure if their complaint would have fit in to a reasonable charge by the California Civil Courts. 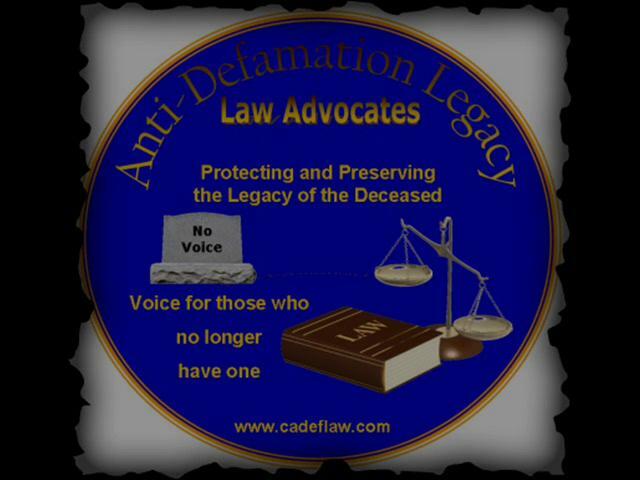 However, with a law against defaming the deceased Michael Jackson’s heirs would have either a possible tool or possible deterrent against a new piece of defamation. Are you ready to help support the CadeFlaw Initiative? If this latest defamation bothers you, has left you angry and feeling helpless then, come help make the CadeFlaw Initiative a Law.